When world-famous Swedish photographer Anders Petersen (1944) had to select a partner for his latest group show, Cities, Stories, Diaries, which will be hosted by the Art Academy of Latvia from 12 august through 12 September, he invited the young Danish photographer Jakob Aue Sobol (1976). In contrast to the internationally recognized and awarded Petersen, who rose to fame with his series of portraits featuring the drunks, prostitutes and transvestites of Hamburg, the characters in Sobol's photographs are seemingly more “normal”. However, much like Petersen, Sobol looks for an emotional nakedness when achieving contact with his subjects; in this sense, Sobol has gone even further than his Swedish colleague, from whom he has taken inspiration. In the Riga exhibition, both photographers will be showing 140 original works, as well as their photo-books. Anders Petersen's display will be his collection titled City Diaries, while Sobol will show photo-stories of cities that he has recently visited. 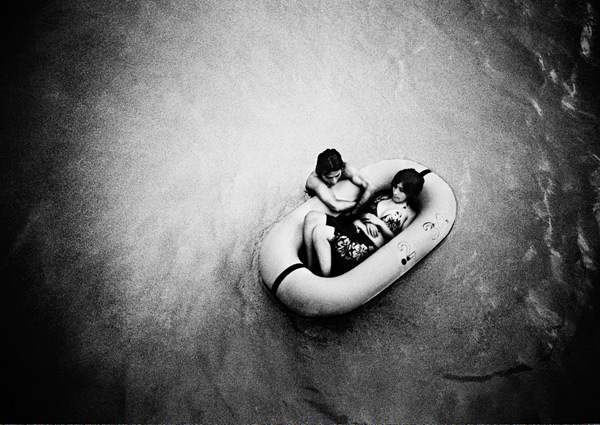 Sobol gained attention with his very first photo-book (2004), in which he documented the time he spent with his girlfriend Sabine in Greenland, and in 2006 he won the World Press Photo award in the category “Daily Life Stories”, for his photo-story on an indigenous family in Guatemala. 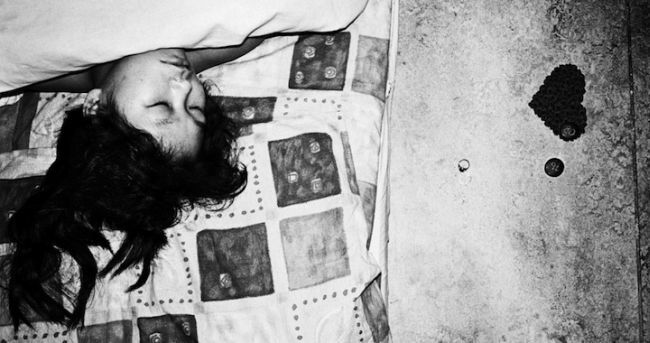 How did you first meet Anders Petersen? Did you choose to work with him, or were you invited? I have to think about this. 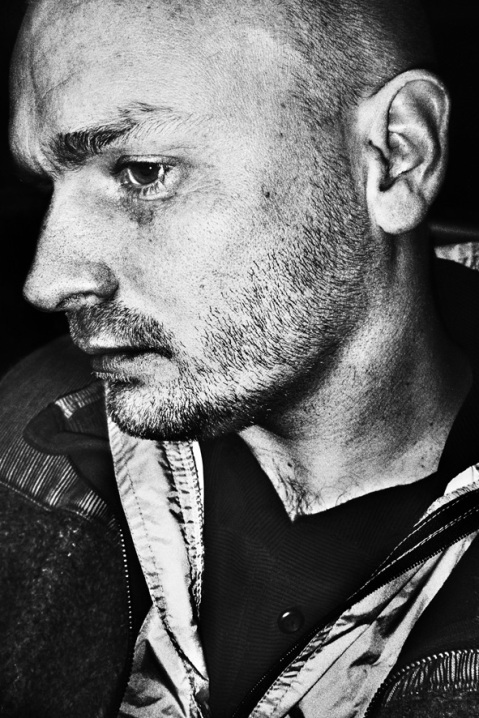 I think that the first time I heard about the project was when Anders Petersen called me himself. He said that he'd like to put on a show with me, and asked me if I'd be interested. Did you know him personally beforehand? I knew of his works, of course, and he had also been my teacher – for a very short time in 1999, at the Danish photography school Fatamorgana. This school had been inspired by Christer Strömholm's school in Stockholm, where Anders taught. He was our guest-lecturer for a week, but I doubt that he remembered me from that time; it's more likely that he had seen my works that were done at a later time. The head of Fatamorgana was Morten Bo. He was very inspired by Christer Strömholm, and that's why he developed a similar school in Copenhagen – with the same approach to photography and way of communicating with people. What is this special approach? For me, it was unlike anything I had ever experienced before. At the time, I was a complete beginner and I hadn't taken many pictures. Every week we had a new guest-lecturer, and I had the opportunity to learn various approaches and to try them out. That was a part of student life – meeting new teachers and getting to know their work and methods. With Anders, it was special – I could feel his fascination with other people. He wasn't somebody who looked in from the outside, but rather a photographer who was ready to put his camera aside, meet new people, get to know them, and only then – take their pictures. It was more subjective; it was more about meeting someone and the intimate contact that occurs between you and the person that you are photographing. 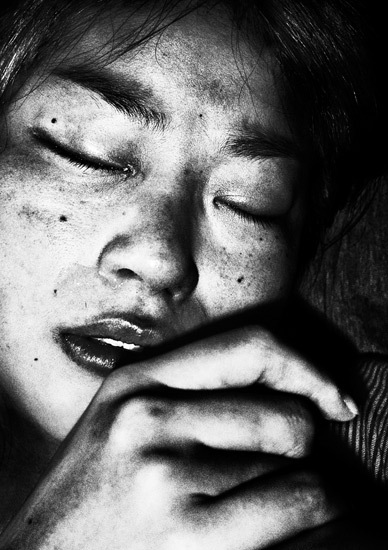 Was Anders Petersen your main inspiration? At the time, the inspirations were many and varied, including Nan Goldin and Martin Parr – who was a completely different kind of photographer. I just want to say that I was 21 back then, and I was very open to trying different things. One week my pictures looked like this, the next week they were different. Later, when I finished school, I had to find myself, my own language, and that was a challenge. How did you find your own language, and what did it consist of? When I finished college, I decided to go to the eastern coast of Greenland, a very desolate region. There were several reasons for doing this – my father had recently died, and he had been to Greenland and told me many stories about the place; he had also given me a book by an artist from Greenland, which had very minimalistic drawings and poems about daily life on the eastern coast of Greenland. The author of the book was both an artist and a poet? Yes, and also a hunter. The book was about the conflict between the traditional way of life and the modern world. Denmark colonized Greenland, and there exists a conflict between the traditional Inuit culture and Danish culture. A part of his poems were on this theme. I thought it would be interesting to do a project in eastern Greenland about this strange connection between the past and the present, and the current cultural conflict. But it ended up completely different because I fell in love with a local woman, Sabine, and as a result, I spent two years living in her village of about 150 people. I lived with her family, who taught me to hunt and fish, and so that's what I did then. During that time, there were about six months in which I didn't even do any photography – I didn't feel like I should; there were other, more important things to do. For example, making sure the family had enough food. I discovered that in these small villages, the people are rather poor, even if they do receive a lot of subsidies. When I went out to hunt and photograph at the same time, they couldn't care less that I returned with two full rolls of film. And why should they? But when I came back with a seal or with fish, the whole family was happy. One seal could feed them for a week. That's how they survive. That became my daily life. After about six months, it was time for the christening of Sabine's sister's child. Sabine was very happy about this and she started to dance at the house, even getting up on the table; as she held up her skirt, her ripped pantyhose were revealed. I remember that moment as the first time that I felt that I want to photograph again – because what I had seen was something that I wanted to remember and hold on to. I only had a small camera for snapshots because the big one was broken. So, with the small camera, I saved her dancing for posterity; afterwards, I began to photograph every emotional situation that I felt that I wanted to document. Namely, I began to photograph daily life with my girlfriend, basically taking inspiration from love and curiosity. You hadn't taken pictures of such subjects before then? When you head to new places, often times the only ones who want to communicate with you at first are at the people in the margins of society. It's an easy rut to fall into, because their environment is more dramatic. In a sense, that's what happened to me in Greenland as well, since I had arrived to do documentary photography and I worked in a very traditional way – with traditional compositions and so on. But then I began photographing my girlfriend with a pocket camera, and the process became much more playful and incidental. Before, I used to photograph every dramatic situation from various angles – which is characteristic of photo-journalists – but with the pocket camera, the sequences and pictures were completely different – one picture, for instance, was of the shower; the second – of a child jumping from the roof; the third – of us, out hunting. It also think that when I lived there, I had put aside my identity and my nature of being a photographer. It was, however, always in the background – whenever I went to visit somebody, I always took along the small pocket camera, even though I usually never even used it. You said that when you entered a new environment, it was usually the marginalized people who first showed their interest. Why do you think that is? They want to communicate because they're in a difficult situation. That's why they approach people who have come in from the outside – because they want to meet people with whom they can talk. But the challenged I faced in Greenland was to photograph people who lived a more regular kind of life. And that's what I've continued to do since then, although many people think that I photograph the marginalized. That's because the way that I photograph the middle class – for example, in Denmark or Tokyo – is so intimate and close. And that's the way that we usually see poor people in photographs. It's interesting that those who have been marginalized by society are more open than “normal” people. In any sense, every time I arrive in a new environment, they are the ones who approach me and wish to communicate. When you take pictures, do you separate the marginalized people from the “normal” ones? No, I don't. I photograph everybody. I don't have a plan – photography is incidental. When I walk down the street, I'm completely open. I try to block my thoughts and be as irrational as possible. I photograph everything I see. It could be a poverty-stricken boy or a rich woman – anybody; belonging to classes means nothing to me. But I have noticed that there are certain preconceived notions about how people from different classes are photographed. Does one need to put in effort and have a certain attitude in order to get people to open up and allow themselves to be photographed? You have to be completely open and demonstrate that you are also vulnerable. You can't be just a photographer – you have to discover who you are yourself. If you don't, people won't open up to you. That means that you mustn't avoid being vulnerable. For me, it's a kind of exchange. Even though I'm the one taking the pictures, my ambition is to achieve an equal exchange between myself and the person I'm photographing. As I understand it, your main goal is to portray people as they are. So why do you look for these moments of openness and intimacy? That's has to do with my own wishes. We all wish to be together with other people. I feel free at those moments. That's one of the reasons I use pocket-sized cameras – because they allow me to be physically close to those whom I will be photographing. Are you able to be an observer – a press photographer? Yes, but in my case, only concerning the technical aspects. I rarely take on press photography work, but when I do, I still try to keep my own approach. However, it's not possible to adhere to that in full because there are deadlines and limits. I don't have the necessary time and space to create intimacy. Has photography today been divided into more segments and approaches than there were before? That's a question of whether or not I know enough about the history of photography in order to declare if it is different know than it was before. But I have a felling that there have always been several directions. Maybe it's just become more visible now due to the increased availability of information, and the fact that everyone can be a photographer. Everything happens really quickly, and if you see a picture in which the photographer has involved himself emotionally, and in which he has invested his time, then that is a really powerful experience. However, I think that ever since [Henri] Cartier-Bresson and [Robert] Capa, Magnum has always had two approaches – one oriented more towards photo-journalism, and the other one being more artistic. We tend to compare photographers with one another when, in fact, they are as different from one another as other people are. Perhaps, it would be better if photographers weren't compared to one another, but rather with, for example, painters or journalists. In my opinion, a camera alone does not place all photographers into one family. What would you say about yourself in this regard? To me, the camera is a tool with which to express myself. Do you always take black and white photographs? 95 percent of the time. I have a new project in Denmark – “Home”, which is a mixture of black and white and color photographs. But it's like that every time I start a new project – I first work with color photography, and then I go on to black and white. When I edit my work, I look at the pictures and search for the same thing that I do when I'm taking the actual pictures. I look for something intuitive, something emotional, and I always lay out copies of the pictures on the floor. If I don't connect to them, if I don't feel them, then these pictures don't count for me and they aren't worth anything. But I can't explain to you why I can't connect with colored pictures. I have to identify with my images – that's something that's linked to my personality. Your work reminds me of photographs of the 1970s and 80s. Do you think that the greatest thing brought to photography at the time was the way they portrayed intimacy and depth: with a contrasting black and white tonality – with characters that seem to emerge from the darkness? It is not my ambition to come up with something that hasn't already been thought of. That doesn't concern me. Yes, of course I come from some direction of photography, and maybe it is from the 70s and 80s. I don't know. In any sense, when I look at my work and that of many others, I see very contemporary photography. And, of course, one can always hear these sorts of comparisons to history, but that really doesn't concern me. My ambition is not to invent something new, but to live and experience the world and the people I love, and to tell this story by using photography as a diary. That seems to be the spirit of the times – a boredom with people's attempts at being innovative. Just recently, I interviewed an illustrator who uses drawing techniques that other people have invented, and she said that she doesn't have any ambition to create something new, but simply wants to portray the world as an image. Maybe that's linked to the fact that the world is currently overcome with innovation? Yes, but at the same time, I think it would be hard to find a photographer today who has come up with something that hasn't been seen before. Can you name anyone? I, personally, don't know of any. Yes, you can find superficial similarities – you can compare contemporary, contrasting black and white photography with post-war photography – for example, with Japanese or 1970s photography – but I think that contemporary photography is much more personal and subjective. I just thought of, by the way, two veteran Latvian photographers who took contrasting black and white pictures – Gunārs Janaitis and the photo-journalist Uldis Briedis – but their pictures really didn't have the same level of intimacy as yours do. Why do contemporary photographers dare to be more intimate? From where does this need for greater intimacy come? It is obvious that this is not happening just in photography. It's connected to the times we live in. Perhaps we have become more egotistical, and now we're also using photography as a mirror of our inner world. Maybe before, our group-mentality was too powerful to do such a daring thing and to be so subjective – I don't know. You don't have to hide your feelings anymore? To not hide your feelings is... almost the only thing that there is left to do (chuckles). Today, there are so many opportunities. At least in my country and in the Western World. These, of course, are also searches for meaning. I grew up in a place where we didn't have anything to struggle for. Everything was given to me, and maybe that's what makes me look for something else. Related article: An interview with Anders Petersen "A True Amateur - Anders Petersen"
You mentioned earlier that you think that your photography is very modern. What do you mean by this? In what way is it modern? In terms of content? You forced me to say that (chuckles). I'd say that my photography comes from an established tradition, but that it has its own voice. That's the way I feel about it. If you are very closely tied with your visual work, then that reveals your personality, and the work is unique in the sense that we are all different. And yes, I do think that my approach and my work-mentality are modern. Of course, in a purely technical sense, high-contrast black and white close-ups aren't especially modern. Is your approach modern in the sense that you identify with the person being photographed? The axiom is to get involved in the situation, to take part in life. To not be somebody who looks at life from the sidelines, which is how it's traditionally been in the photography profession. Not to be a gawker. But, of course, it's impossible for a photographer to completely avoid the position of being a gawker. But you have to at least minimize this ambition in a way that it doesn't become the dominant aspect. I also always want to be involved. I saw one of your pictures of Tokyo, in which there weren't even any people – just an abandoned industrial area. Similarly, you also have pictures of just trees. These themes are a bit different than portraits, which usually dominate in your work. Yes, and that is the most interesting thing. My photography has also evolved. In the beginning, when I was taking pictures of my girlfriend in Greenland, years passed before I could finish my next project – I thought that I am only able to photograph somebody that I love. I just wasn't used to it being any different – if I didn't get that special feeling, then the picture didn't seem to be worth it. And that, of course, came about from photographing a person with whom I was in love. But later, when I began to take pictures in Tokyo, things changed; there I met people on the street, and I discovered that I can also experience this intimate moment in a very short meeting. Even if I had been together with this person for just two minutes, on the street, it was still a very intimate situation; you meet one of more than 10 million people in Tokyo, you tell him that you think that he looks very interesting and that you'd like to take his picture, and then you do. I understood that I can take pictures of not only people that I love, but of other people, too. 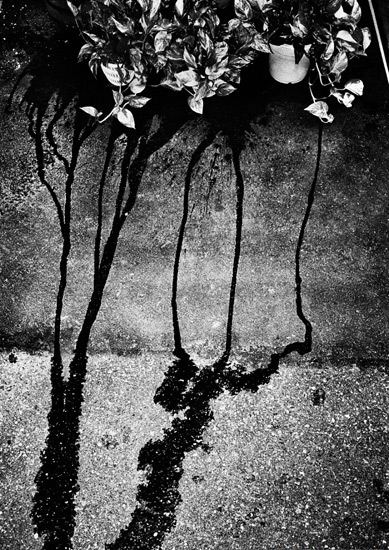 And then I went even further – I understood that I can also portray intimacy with buildings, with plants, with trees. Namely, I could portray an emotional journey – my intimate feelings – towards a city. 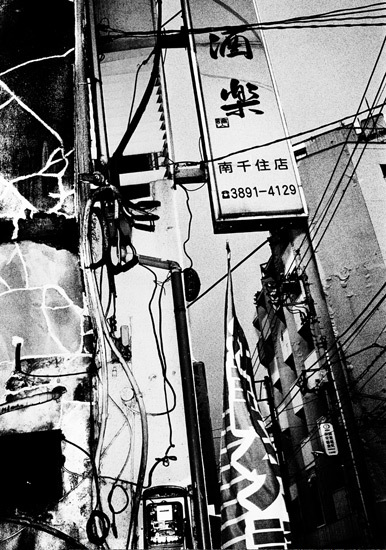 The Japanese photographer Daido Moriyama has also definitely experienced something like that. He's also a snapshot photographer, and when he walks down the street, he's able to photograph everything. At the end, I could walk for hours down just one street – there were so many thinks to photograph and people to meet. That completely opened up my outlook. So you're ready to evolve, but the primary condition is always, in one way or another, to discover life instead of just watching it happen from the sidelines, right? Yes, but it can also be discovered in a forest, or in a building, not just in people. What's the difference between those photographers who observe life, and those photographers who take part in it? Do the latter not have any ambitions towards objectivity? Are they taking a bigger risk? The risk is much larger because you feel a responsibility towards the people you're photographing. When I spent two years photographing my girlfriend and then published a book, I took on that responsibility. I discussed the selected pictures with her, and I do the same with other people. Of course, situations and people differ. I definitely feel more responsibility when portraying a scene in which there are people whom I know personally. Before you publish your pictures, do you send them to the people who are in them? That depends upon what we've agreed to. Some people don't care what happens to their pictures. Nevertheless, when I photograph people, I usually take along some pictures to show them how I work. And some of them don't care – they just like having their picture taken. Others want to see what will be published. I usually keep in touch with those that I photograph – except for the ones I just meet on the street. You're a member of the prestigious Magnum organization of photographers – how did that happen? I don't think that there are any Latvians in Magnum. I'm the first Danish photographer in Magnum. There are just two Scandinavian photographers in Magnum – the second one is Jonas Bendiksen from Norway. We're very different. He's a photo-journalist and photographs in color; he works a lot for National Geographic. Of course, every photographer has an individual approach, but I think that in Magnum, it's even clearer that every member has a distinctly individual language of photography. But how did you become a member of Magnum? It was by accident – I had never dreamed of becoming a member of Magnum. I had never even thought about it. I began showing my work in international exhibitions, and I was invited to London to meet some photographers from Magnum. I got to know them, and their organization grew on me – partly because of the fact that for ten years, I had been working on my own and, of course, that's very lonely because you have to think up your own project, bring it to fruition, then market it, and then at the end – exhibit it. In that sense, it was really great to become a Magnum photographer because so many opportunities opened up. So, you were invited to join Magnum? They asked me to apply for membership. Actually, you don't have to be invited to apply. But I had talked to some Magnum members about joining, and in the end, they encouraged me to apply, just like thousands of other photographers do. I had a five-year test period during which I was a nominee, and then an associated nominee, and every year I had to show new work. First, you're a nominee for two years, and then they take a vote on you. I didn't get enough votes the first time, so I was a nominee for one more year. The next year, I received enough votes and became an associated nominee; then I had to wait two more years, after which they voted again, and then I became a full-fledged member. So, Magnum has a very demanding system? Yes, and some photographers have been nominees or associated nominees for three or four years, and then they get thrown out. That's a very difficult situation, because after such a long time, you begin to already feel like you're part of the Magnum organization. In my case, the turning point was a project in my homeland of Denmark. It was a new step towards going back to putting personal content into my work. In my opinion, this also played a part in my getting accepted into Magnum – perhaps they appreciated the fact that I wasn't just a photographer who traveled around the world, but one who also worked in his home environment. What exactly was your Danish series of photographs about? The ones that got you into Magnum, that is. Actually, it was about the same things I always do. Basically, my themes revolve around six or eight situations. But I never thought that I'd be able to successfully portray my own country because I know it so well and I know the language – sometimes that can be a hindrance. In addition, I was used to photography being a physical thing because when I'd meet people, we usually wouldn't have a long conversation – I'd just simply take their picture. But in Denmark, I had to explain a lot. Once I got over this, I saw that I had a lot in common with people from my culture, and that that's another step going deeper into my emotional life. Now, when I look at my Copenhagen pictures, I seen in them a connection to the pictures that I took elsewhere in the world. It's just coincidence that I lived in Greenland for two years, in Japan for two years, and so on. In my case, my traveling was always based on my falling in love, and following that person. Isn't the reason that photographers, including you, often go abroad is that there's this notion that it is easier to understand something by looking at it from the sidelines? I don't do it because it's easier. But I must be truthful and admit that I do it because I find traveling exciting. I'd never be able to spend my whole life in one neighborhood or one country. I'm inspired by people from other cultures. Meeting people from other cultures is a part of life, in my opinion. For example, I just completed a photo-project for which I took the trans-Siberian train from Moscow to Beijing. That was a project that I wanted to do ever since I was a teenager; and of course, discovering a land that you've never seen before is an adventure. But you are right – it certainly is possible to go on an adventure in your own country, in your own neighborhood, or in your own yard. And I do that, too – I go on adventures with my girlfriend and my mother. Your decisive trip to Greenland also wasn't primarily just to travel to foreign lands, but to follow in your father's footsteps, right? There was a combination of various factors. I had once written about the youth in Greenland – nothing important, just a paper for school – but it was very interesting to find out what was going on in Greenland due to the culture clash. I read all of the statistics about the youth and their high suicide rate, and how they struggled to create their own identity. It was intriguing. But the people of Greenland had their own identity, didn't they? Yes, but now they are trying to create their own identity in a modern society – something in the middle between the traditional hunter lifestyle and the needs of modern-day life. In the village in which I lived, the latest status symbol was a wide-screen television. Of course, the contradiction between a traditional way of life and modernity can be found all over the world, but in Greenland, development happened extremely fast. It didn't happen gradually, but over just a few years. Like in the Amazon? And have the people of Greenland been able to balance the traditional with the modern? No. That's why they have the highest suicide rate in the world, and that's why they have such rampant alcoholism and so many problems. OK, I'd say that half of the inhabitants have been able to deal with this dilemma, and they use modernity constructively. For example, instead of killing a seal with a harpoon, they use guns. In other words, they have a lot of modern things that one part of society uses correctly, but the other part, whose members have gotten lost in life, suffer from this modernization. In large part that's also because the Danish welfare system has been implemented in Greenland. A lot of people don't want to hunt anymore because they can simply go to the social office and get their payment, which is enough so that they don't have to hunt anymore. Half of the young people aren't being raised as hunters anymore, but then the question arises – what are they going to do instead? What are these 150 people, who live on the side of a mountain and where I lived for two years, going to do now that they don't have to hunt anymore? Consequently, a lot of them commit suicide. And it's being done by men, especially young men, because they were the ones who supplied the family with food. That's why I talk about them having lacking an identity – they used to be hunters, but now they are nothing. Did you go to Guatemala to tell a story about the indigenous people? No, I went there because my twin brother was going. He's a journalist. He was making a film and took me along as the cameraman. That wasn't my project, but that's what it transformed into. Like many times before, I went along with him and I was frustrated because I couldn't communicate with the locals because I didn't know their language. That's the way it almost always happens – I go somewhere, the place interests me, and I want to return. And I did return; I stayed there by myself for a long time, I learned Spanish, and then I lived with a family for a month, photographing their daily lives. Will you return to Riga? No, I'm not going to travel that much anymore (laughs). I'm going to marry my girlfriend and we want children; and, of course, we will travel together. I'm not that excited about traveling alone anymore. You mentioned that the camera is simply a tool for you. If you hadn't chosen the camera, which instrument would you have chosen instead? Did you have any other alternatives? I come from a family with a long tradition of photography and journalism. My twin brother is a journalist, my father was a journalist, my mother is a photographer, and my grandmother was a photographer. So maybe it didn't happen quite by chance. But what else could I have done? I began my career as a cameraman, but it was very hard for me to create that intimate space with a whole film crew around me.